The stock market's remarkable run reached a new milestone today. 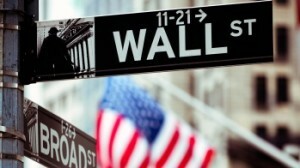 The Dow Jones Industrial Average closed above 16,000 for the first time. Let's vow not blow it when Wall Street goes to the dogs again — as it inevitably will. If you have a diverse, balanced portfolio of stocks and bonds in your 401(k) plan at work, in an Individual Retirement Account or at an online brokerage, you're probably doing pretty well right now. We're a world away from the dark days of the financial crisis and recession that saw the value of those investments drop by 30% or 40%. Maybe more. 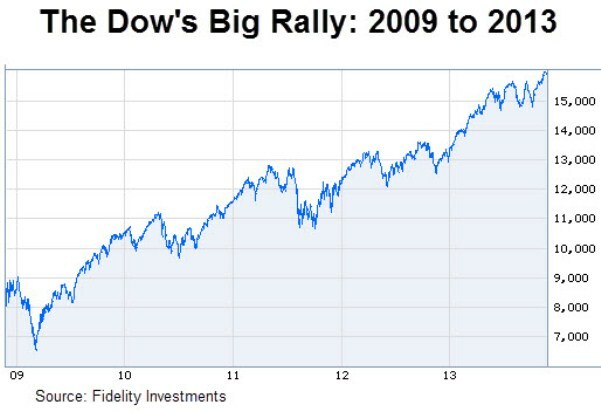 When the markets hit bottom on March 6, 2009, the Dow closed at 6,626. Christopher Currin, a certified financial planner with Pegasus Advisors in Dallas, says, "16,000 is an arbitrary number, and isn't significant in and of itself. But it's a reminder of how far we have come since the sell-offs in 2008." It's also a reminder of why middle-income savers trying to build financial security for themselves and their families have to be in the stock market. You don't have to be rich or lucky to succeed. It's as easy as making regular, automatic deposits into a tax-deferred 401(k) or IRA and arranging for that money to go into a target date mutual fund that's tailored to when you expect to retire. The only hard part is resisting the temptation to bail when the markets turn down again. Here's a little secret of why the rich always seem to get richer. Lots of affluent families have been making money on Wall Street for generations. They have lots of experience with market volatility. That made them much more likely to take a deep breath and stick with their stocks and bonds through the worst of the recession, confident the markets would eventually recover. Far too many middle-class savers, who had just begun investing through retirement plans or online brokerage accounts, panicked and sold. About $445 billion fled domestic stock mutual funds — the primary way most of us invest in the markets, especially through 401(k)s and IRAs — from 2007 through 2012. We know that hard-working families hit by layoffs had no choice but to tap their savings, including retirement accounts, to pay their bills. But whatever the reason, the result was the same. 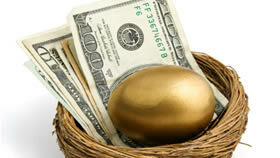 Too many middle-income investors bought high and sold low, locking in their losses as the markets bottomed out. Now consider what happened to those investors who rode out the crash. Let's say you invested $10,000 in the Vanguard 500 Index fund — a type of mutual fund that tracks the S&P 500 — on Nov. 21, 2003. It would be worth more than $20,300 today. You would have doubled your money over the past 10 years despite the worst economic crisis and downturn since the Great Depression. Currin says it underlines the importance of why we need to take a long-term view of the stock market and not panic when it has a bad day, week, month or year. What happened in 2008 and 2009 now looks like a hiccup in a long-term trend of rising market growth. 401(k) contribution limits unchanged for 2014Putting as much as the government will allow into these tax-deferred retirement plans is a critical milestone in almost everyone’s effort to build financial security for themselves and their families. But according to the Federal Reserve's most recent survey, 6.7% of us do so. How close will you come to those contribution limits next year? But these record-breaking numbers doesn't necessarily mean we'll continue to see this spectacular level of market performance. When markets reach a peak, they sometimes experience a "correction" of a few percentage points over the following weeks or months. The experts all know this. David Shucavage, president of Carolina Estate Planners in Willmington, N.C., says much of this market growth has been fueled by a natural rebound from the 2008 financial crisis and the Federal Reserve's economy-boosting policies. He is concerned the market has risen too rapidly and what's going to happen when the Fed reverses course. Joe Lucey, president of Secured Retirement Advisors in Minneapolis, says the market has risen 28.5% so far this year compared to an average annual gain of 9.8% over the past 50 years. He says it's not a question of how much higher the market will go, but when it will take its next breather. Now's the time to prepare for that. Now's the time to decide that you aren't going to panic when the Dow starts falling back below 16,000. Or 15,000. Or whatever the crisis of the moment dictates. Now's the time to vow that you're going to do what it takes to make Wall Street work for you and build the nest egg you deserve.